When Harper comes to in the hospital, she begins to feel a bit …strange. She sees things that can only be described as weird-shapes emerging from a foggy grey mist, snarling teeth, creatures roaring.But Harper’s not crazy. 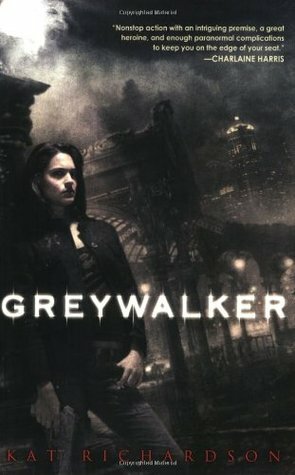 Her “death” has made her a Greywalker-able to move between our world and the mysterious, cross-over zone where things that go bump in the night exist. And her new gift (or curse) is about to drag her into that world of vampires and ghosts, magic and witches, necromancers and sinister artifacts. Whether she likes it or not. I’m not really sure what to say about this one. It reminded me of a few different things, namely dated detective movies, which I actually love, a vague hint of Jessica Jones and a bit of Daniel Jose Older’s Bone Street Rumba series. Yet, I can already feel myself forgetting the main character’s voice and the plot points. This book, along with other books in this series in on my #RockMYTBR pile for this particular challenge, but I am not at all enthusiastic about jumping into the rest of the series. The first person perspective of Harper’s telling of the story is, for the most part, tolerable, but the pacing of the narrative and her slow acknowledged obvious facts and alarming truths about her new “life” made it difficult to hold any interest in this story. Moreover, the action/dangerous scenes in this book felt more like child’s play or that of the mild danger level found in middle school books. This series first came out in the early 2000s, but I’m fairly certain it was never intended for a younger audience. This might be the shortest review I’ve ever really given to a book I’ve rated below 3 stars where I wasn’t obsessing over a number of things that bothered me or seemed off. With Greywalker, I guess I just did not find anything memorable or genuinely unique within the concept. So, I may have to see if I can get my kindle to work again to replace this series on the TBR reading challenge list. If your favorite genres include ghosts, crossing over between reality and a world/plane after a sudden near death (half death) experience, than this might me a book (series) you’d enjoy.